The species has been recorded at several sites in south-eastern England. It is widespread in the Mediterranean, becoming uncommon in the north. The spider was found on pines at Mile End Park and Brooklands. In Essex it was found on gorse growing on brownfield land near the Thames and on wild privet and hawthorn scrub growing on a south facing bank. It is probably colonising suitable habitat in areas with a sufficiently warm climate. 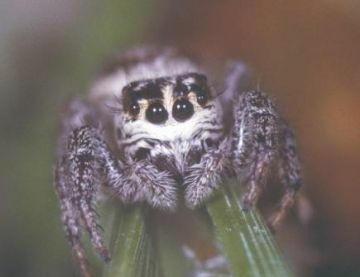 This jumping spider was first recorded in Britain in 2002 at Mile End Park in East London (Middlesex) and subsequently found at Brooklands, Surrey and two sites near the Thames in South Essex. In Europe the species occurs mainly in southern and central Europe, but occurs as far north as Belgium. Although it was originally thought most likely that the spider had been imported with pines into the Mile End Park site, it now seems more likely that the spider has naturally colonised Britain from Europe and is in the process of spreading. Three of the four known sites are threatened by developments. Housing and retail developments, together with associated amenity landscape schemes, probably threaten many potential sites in the south-east. Management to retain scrub and pine in open south facing conditions would be likely to favour this species.